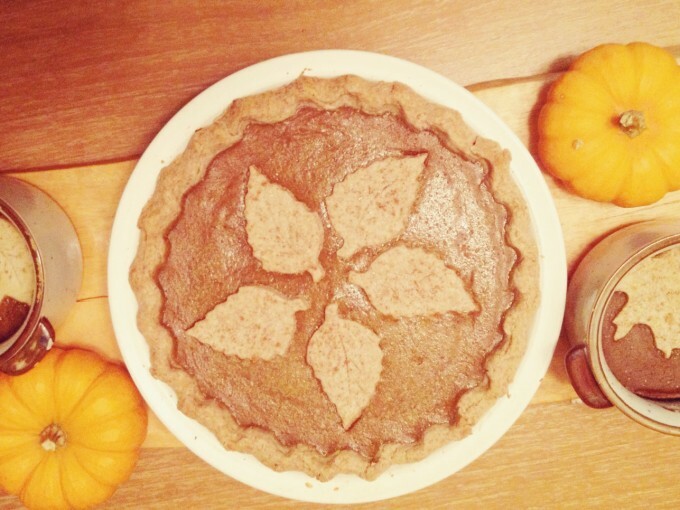 As part of our homeschool baking program for October,we baked a total of seven pumpkin pies. Each week they progressively got better. Even though I was supposed to be teaching our ten year old how to make pie, I had never really baked pie before myself! So, we learned together, which was wonderful. There are a few allergies in our home, and those who don’t have to worry about them aren’t ready to give up spelt flour, cream, butter or eggs, or whatever combination of those ingredients they each can have. So, we make a few variations. 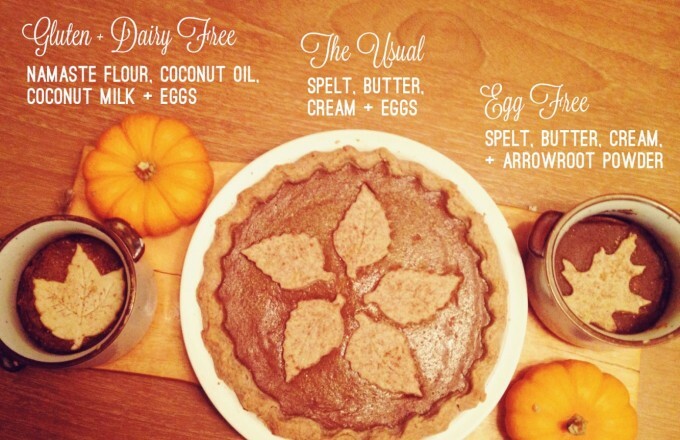 Below is an overview of how we made: Spelt Pumpkin Pie, Gluten + Dairy Free Pumpkin Pie, and Egg Free Pumpkin Pie. One of our little ones has a gluten and casein free diet, and the rest of us join in now and then simply for the sake of consuming less of these foods that can be hard on our bodies. Combine the flour and coconut oil in a large bowl until crumbly. Slowly add in the water, little by little, until the dough comes together nicely for rolling. Shape the dough into a flattened disc. Place it on a flat surface, on top of a sheet of wax or parchment paper to avoid sticking. Cover with a sheet of wax or parchment paper. Roll the dough out, on top of the parchment. This will stop the dough from sticking onto the rolling pin. 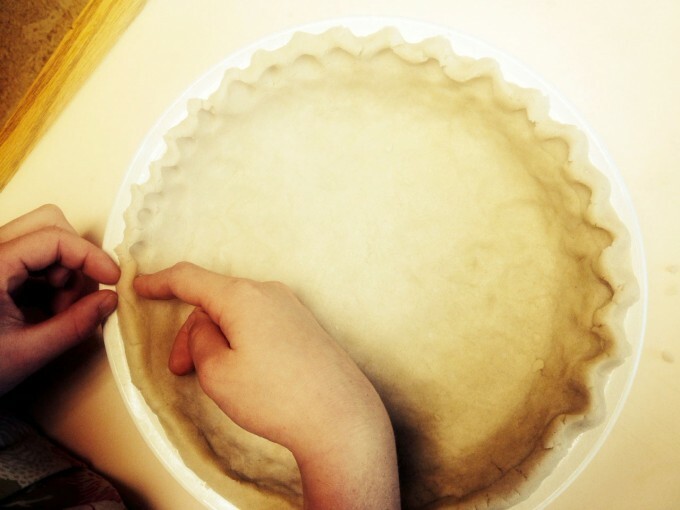 Once the dough is slightly larger than the diameter of your pie plate, peel off the top layer of parchment and flip the dough into the pie plate, with the remaining paper on the surface. Peel off the parchment, and press the dough into the pie plate. If it breaks up a bit, just press it back together where necessary. Fill the crust with the pumpkin filling, and bake at 450F for 10 minutes, followed by 350F for 30 minutes. 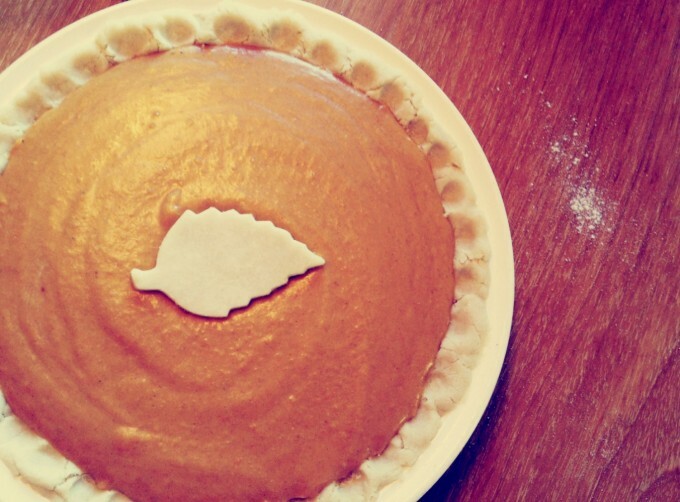 The good news is that most pie crust is already egg free, which just leaves the filling. For the first two weeks of pie-making we used flax-seed egg replacer (1 tbsp ground flax to 3 tbsp water per egg). Our poor little guy’s pie never really tasted great. This week I did some research and found that a lot of egg-free pie filling includes corn starch. While we don’t like to use corn starch, mainly due to GMO content, arrowroot powder is a great alternative. This week, the egg free pie filling had a much better consistency and taste. To make this pie, we used the same recipe as the spelt pie, but omitted the eggs and added in 1/4 cup of arrowroot powder. We also made them in a mini version this time (second photo). 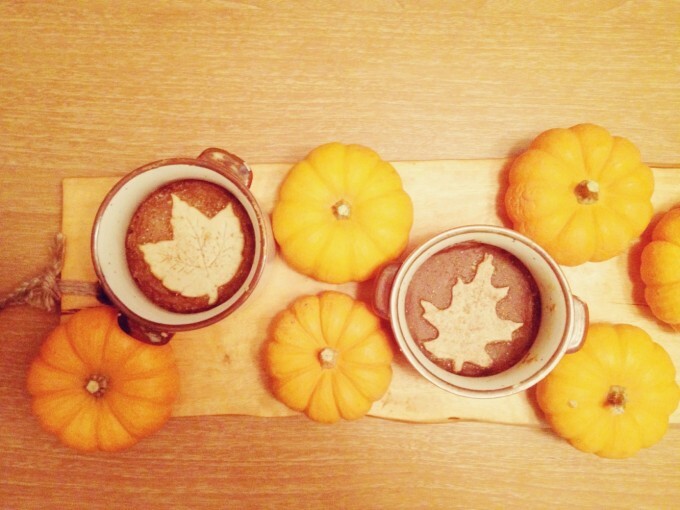 The last three weeks of pumpkin-pie making and eating have been great. 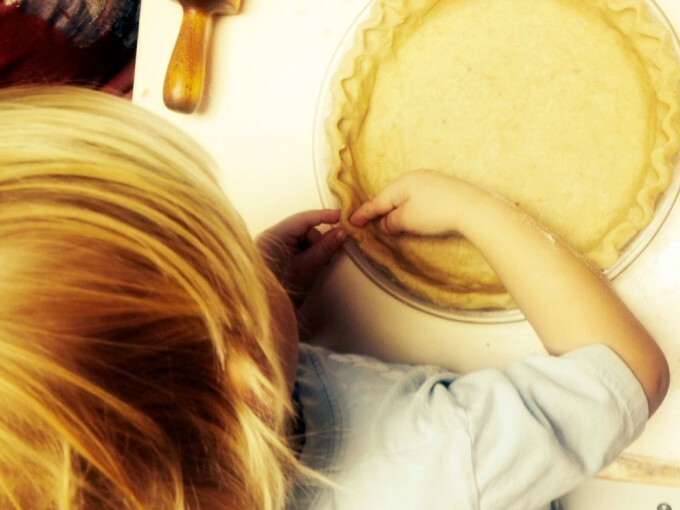 Our baker-in-training feels fairly comfortable making a pumpkin pie from scratch and the two of us will be ready to tackle thanksgiving next year, now having the details ironed out. 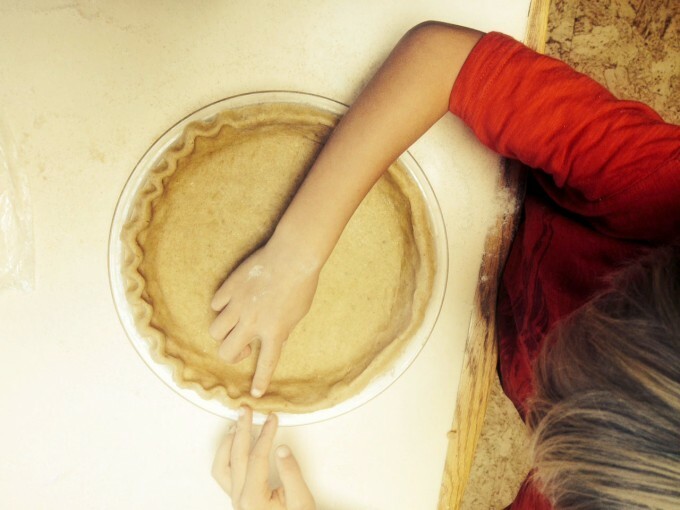 And the other littler ones got some practice decorating pie crust – I never would have thought it was so simple that a three year old could do it! As the weather gets even cooler, we’ll be thankful for our next lesson – bread making. Looking forward to a warm kitchen and a home filled with the aroma of freshly baked sourdough. This post was shared as a part of Simple Lives Thursday at My Humble Kitchen, Fight Back Fridays at Food Renegade. and Simply Natural Saturdays at The Pistachio Project, Fat Tuesdays at Real Food Forager, Real Food Wednesday at Kelly the Kitchen Kop, and Thank Goodness It’s Monday at Nourishing Joy.